Part 2 – Installation of client machine. The first step of Part 2 is to download the software. 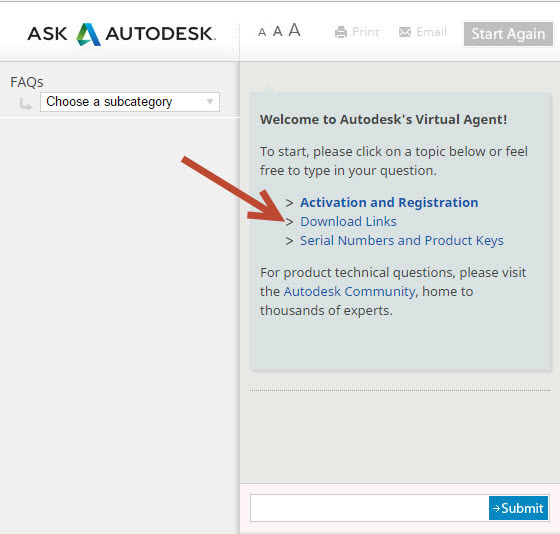 Please use the Autodesk Virtual Agent to download the required software. Remember you can install up to 3 versions back if your product is on active subscription. Here is the link to the process to follow using the Autodesk Virtual Agent. Click on the link at step 1 to start up the Virtual Agent. In the dialogue box where you add serial number, Select Network option on the right and add the single server name the same and your server host name. Also add the serial numbers and product code of your software on the left hand side. Now open the software and test. We assume you only have a couple of installations to do so simple go ahead and install the software and service packs on all the PCs. If you have, say more than 5 client PCs, a good idea is to use a Software Deployment whereby you create an executable package which can be installed on each PC by simply clicking one exe file. This process is not included in this article.